"When I ran my first 9.8 seconds, I didn't believe it. I ran it, I felt comfortable, I felt relaxed but I thought: 'Ah shoot, here we go, maybe something happened with the clock but I have to do it again.' 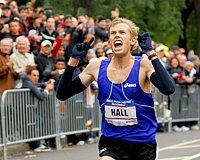 I ran 9.97 in my next race and I was like: 'It's possible.' And when I ran 9.8 again, that's when I knew that it was legit. I'm the type of person who believes you have to do it again." -Tyson Gay, the world's greatest and most humble sprinter, speaking at a press conference prior to this weekend's adidas Track Classic. Dire Tune To Go For 1 Hr World Record at Ostrava on June 12th Haile G got it last year on the men's side. Can the Boston champ Tune get it this year? The record is 18,340 meters which is 5:15.9 mile pace. Stefano Baldini Picked To Defend Olympic Marathon Champ We're kidding about it being a surprise. Let's hope he gets training soon after getting a stress fracture in London. Athletics Kenya Names Provisional Squad of 120 For Olympic Team That It Wants to Go In Training Next Week Until Olympic Trials This decision was announced with 1 week notice and upsets a lot of managers and athletes. Imagine having your whole season mapped out and then being told you have to report to a training camp you didn't know about. This blog post by author Pat Butcher sums it up with a quote from an agent, "Firstly, I can�t be quoted, because my mother would be very unhappy at the language I used. Also, these people are so stupid and arrogant that they would try to ban anyone for criticising them. If they got any stupider, they couldn't get out of bed in the morning." More Kenyan News: Peter Rono Says Stop Baseless Accusations Versus Kenyan Runners They've been accused of fueling the violence in Kenya. US 1500m Star Treniere Clement to Run Her First 1500m This Weekend at adidas Track Classic We'll have a preview of the meet tomorrow. 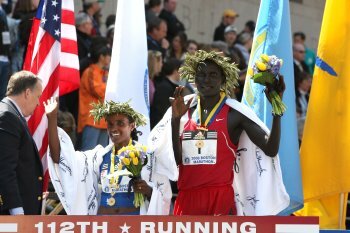 Rose Kosgei, Benita Johnson to Race at 2008 Freihofer's on May 31st Kosgei did an excellent job rabbiting Shalane Flanagan to her American 10k record. Marathon Ace Abderrahim Gourmi Added To 2008 Healthy Kidney 10k Press conference today. We'll have more on it Friday. The race takes place in Central Park this weekend and will feature a $20,000 bonus for breaking Ritz's 28:08 course record. $20k is on the line for a course record and Patrick Makau and Abderrahim Gouri don't have a lot of respect for Ritz's record set last year despite the fact only 3 guys have ever run sub 28:30 in Central Park. Plusan Andrew Carlson update and Marilson Gomes dos Santos. Video: Press Conference Highlights Videos With from Makau and Goumri plus a longer talk (15 minutes) with Carlson. Carlson talks about slurpees, the bitter cold, running a pr (13:38) and getting the sympathy clap, the Olympic trials, Team Wejo Tshirts and more. He definitely hasn't let his 15k championship get to his head. *Andrew Carlson Update THe US 15k champ has been really sick and doesn't have an Olympic Trials qualifier despite having a breakout year in 2008. Susanne Pumper's B Sample Comes Back For EPO - Drug Suspension Starts The 38-yr old Austrian record holder at 3k, 5k, 10k and the half-marathon will at least have her half-marathon record invalidated. They out to rid of all of her records. *There is Hope for Justin Gatlin, Michelle Collins 8 Year Ban Was Reduced to 3 and Now USADA is Letting Her Off Early Because She Cooperated Gatlin hasn't cooperated yet. Star-Studded Two Day Meet Set For This Weekend in Kenya The meet will feature Ugandan Moses Kipsiro, Kenyan 1,500 phenom Asbel Kiprop and Africa 800m champion Pamela Chelimo and others. *Nicole Blood Ran 4:14 This Past Weekendr. On the boards: SEC XC Will Alabama end Arkansas' streak of 34 straight wins. Leo Manzano Gets Big Spread in USAToday Quote of the day for sure tomorrow in here.